It is the latest Trump-bashing claim to emerge from the new memoir, Unhinged, by Manigault-Newman, who was fired from the White House in December for alleged 'integrity violations'. 'If Melania were to try to pull the ultimate humiliation and leave him while he's in office, he would find a way to punish her,' Manigault-Newman wrote in the book, according to the Mercury News. Manigault-Newman implied that Trump played some nefarious role in Melania's immigration to the US from Slovenia in 1996 - even though the couple are believed to have first met two years later, in 1998. 'This is a man who has said he could pardon himself from the Mueller investigation. Why not pardon himself over an alleged visa payoff?' wrote Manigault-Newman. 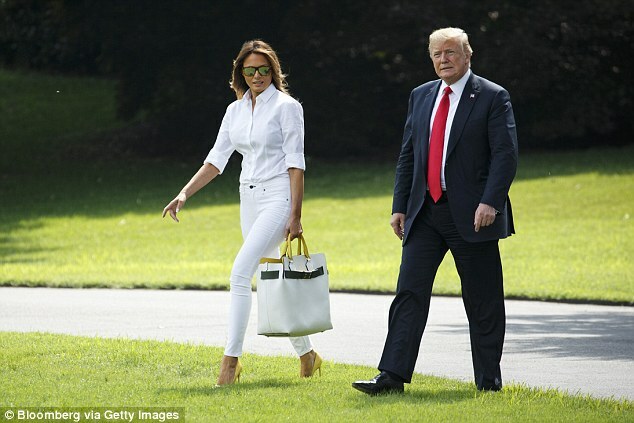 Questions have been raised in the past about how Melania, who worked as a fashion model, obtained a so-called 'Einstein' EB-1 visa for people in the tops of their fields - though immigration lawyers say there is nothing particularly unusual about a top model being granted the visa. Melania became a US citizen in 2006, one year after her marriage to Trump. Newman implies that Trump may have had personal motivations for the policy move, intending to hold the threat of deportation over his wife's head. 'Since Donald is fully aware of however she acquired her permanent citizenship, he could, if there were anything fishy around it, expose the methods and somehow invalidate it,' wrote Manigault-Newman. Stephanie Grisham, the first lady's communications director, refuted Manigault-Newman's claims in a statement to the News. 'Mrs Trump rarely, if ever, interacted with Omarosa. It's disappointing to her that she is lashing out and retaliating in such a self-serving way, especially after all the opportunities given to her by the President,' Grisham said in a statement. White House Press Secretary Sarah Sanders has previously dismissed the claims in Manigault-Newman's book, saying it is 'riddled with lies and false accusations'. the real shenanigan here is that trump appointed omarosa, a fashion model, to his white house cabinet. The way she's looking at The Donald in this picture makes me wonder if she had a Yuuuggge crush on him and maybe came on to him and he rebuffed her, numerous times. I think she's doing this because Trump wouldn't leave Melania for her. Send her back to Zimbabwae! Omarosa is making 'Stormy' look legitimate. USA 2018 Bread and Circus makes the Roman Empire at its Zenith appear as merely a Cub Scout weenie roast. is it possible that she is actually a trump asset?